Please call owner Carrie at 541-933- 1983 or 805-748-3697. Boat is in Charleston, Oregon. Design by Hugh Angelman. 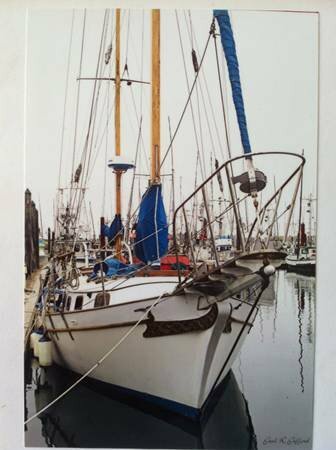 This sailing vessel is fully set with radios, VHF, ST 4000 auto helm, depth finder, Garmin GPS, radar, Ultima bilge pump, Coast Guard pack, Danforth anchor, compass, dockside power, full gauges, 3 batteries, new battery charger 2011, Roller Furling, 3 sails, Chelsea ships bell clock and barometer, single handed sailing, 6 winches, sleeps 7, refrigerator, TV, hot water heater. Brand new diesel Yanmar 3JH4E engine with one trip to San Juan Islands, Construction of the Takarah is made of Fiberglass and Iron ballast. She has gorgeous teak interior and exterior accents throughout. The inside doors to the bathroom and galley have beautiful designed bamboo, palm trees, sunsets carved on both sides. Newer cushions were made for her as well. This boat is documented, and the slip is available. You can also find her in the film by Kevin Costner The Postman. 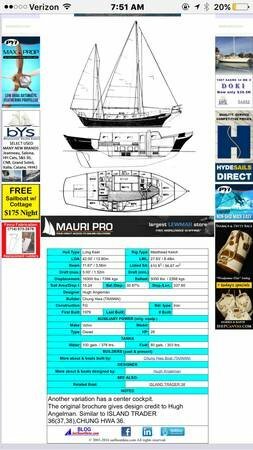 I invite you to check out this classic Megellan 36 on sailboatdata.com for inside details.